This week’s blog, Part One of Two Parts, is quoted directly from the introductory chapter (Pages 2&3) Orchid Pollinators of Victoria 4th Edition, 2016, Rudie Kuiter. Over the years of photographing orchids and their pollinators, Rudie and his team have been discovering much of the hidden world of orchid pollinators. In this first section he highlights the fallacy of the “one orchid-one pollinator” as well as touching briefly on the vast difference between the insects and their role in the ecosystem. Amongst flowering plants, orchids have evolved in their own special reproductive ways. Their pollen is massed as waxy packages, pollinia, unlike like (sic) other flowers that produce masses of fine pollen grains that mostly go astray. The pollinia are relatively heavy and the usually small creatures need to be strong fliers for cross pollination (see image below). Orchids evolved with amazing strategies to attract specific carriers in order to transfer pollen between flowers of their species only, and in this way eliminating the need to produce great quantities. Various insects, many moths, bees and even birds have been documented as pollinators of orchids around the world (v.d. Cingel, 2001). A number of uniquely different examples of orchids attracting insects for their pollination evolved in Australia, especially in the more temperate southern zones originating from Gondwana times. With very few exceptions the Victorian orchids are terrestrial, ground-dwellers, that rely on small insects such as fungus-gnats, native bees, wasps, ants and many attract only the males by sexual deception. In the case no pollinators visits, many species may self-pollinate as a back up. When taking an interest in orchids it seems difficult enough to identify some species. Usually one looks and admires the amazing flowers that may resemble an insect and can be difficult to recognise as a flower at first. An insect on a flower may be thought of something that spoils a picture – until taking an interest in the visitor! I first learned about the orchid pollinators in Orchids of South Australia by Bates & Weber, 1990, an excellent book by today’s standard, but few were seen over the years by just being there at the right time when photographing orchids. 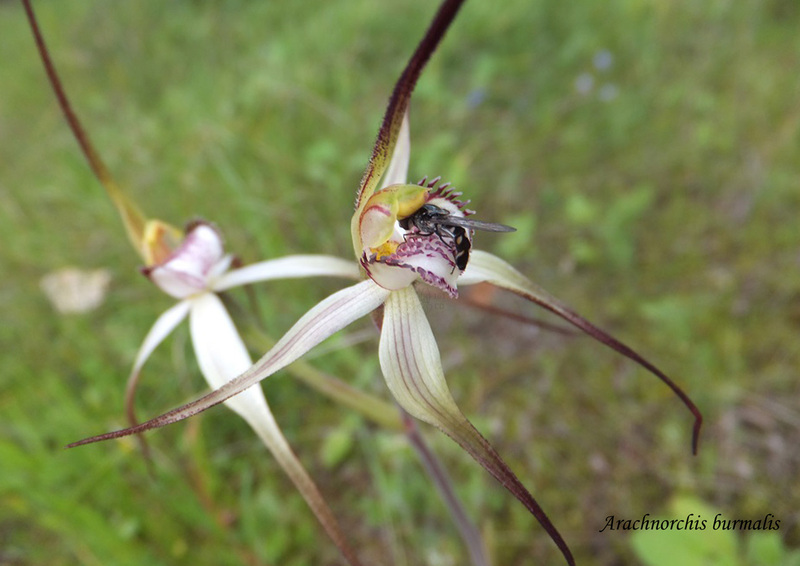 During preparation of the book on Caladenia spider-orchids, certain issues developed from questionable statements made in scientific papers about wasp-pollinators. Of particular concern was about the one-to-one relationship – how only one wasp-species would be involved with only one spider-orchid species – and suggesting populations that were thought to represent the same species comprised different taxa if not pollinated by the same wasp-species. A very different story emerged when monitoring the local spider-orchid populations to find the answers and it became clear that there was much more to it. A site in Wonthaggi with a very large colony of Caladenia dilatata proved to be perfect for this study and also to photograph pollinators as it produces flowers for about four months. It was found that a local wasp-pollinator species typically flies for a little over one month, thus this need to be investigated further. Scientific publications on wasp-pollinators were generally based on short-term experiments, and usually employing baiting methods – moving flowers and often taking them to different sites. Responses included unnatural behaviour or attracting sibling wasps at a non-local site. It is certainly true that a particular flower may attract only one species of wasp a t a locality and a certain time in the season, but this reflects a very small part of the picture. It can be different in the long-term, at certain localities or with a season. The main study site was in coastal dunes, where in a very large population of Caladenia dilatata produced flowers for over four months from September, and under favourable Summer-conditions into January. At least three congeneric (belonging to the same genus) thynniid wasps species were involved in this population. The flying times were up to about 6 weeks for each wasp species, that were separated or slightly overlapping. The flowering times in other populations of C. dilatata in Wonthaggi and Wilsons Promontory were usually about one month in each, and at the corresponding times to the study site the wasps visiting were the same species. A close sibling C. parva in the Wonthaggi heathland habitats and early flowering C. dilatata were pollinated by the same species, but the later flowering C. tentaculata by a thynniid wasp of the different genus. Whilst a flower may attract only one wasp species, the kairomones (chemical omitted by the orchid to attract a pollinator) of a species may vary between flowers within in a population or when allopatric (growing in different geographical regions), just like colour or morphology. Variations maybe in relation to locality, weather conditions, or ground chemistry and available pollinator. Pollinators may evolve over time, but adaptions usually require many seasons and this would vary with location. The observations made over several seasons suggest that more than one congeneric insect is involved in pollination depending on local or seasonal conditions, especially after a long drought. Chiloglottis gunnii populations in Langwarrin were checked for pollinators since a decade-long drought and no action was seen for many seasons. When wasps finally made an appearance they comprised different taxa of Neozeleboria the first season, but only one became the common and principal pollinator the following seasons. Thynniid wasps are very localised as females lack wings and rely on the males to carry them around during copulation and to provide food. It limits their travelling and their homing range may comprise just a few hundred metres. Thynniid wasp are very vulnerable in small reserves isolated by land-clearing, and certain species have gone locally extinct due to conducting burns. Insects form a crucial and fundamental part of an ecosystem, but their importance is never considered in the planned burning, showing a complete lack of understanding by people in charge. So little is known of ecosystem’s foundations, but controlled burning continues – ruining precious habitats. Orchid species failing to produce seed pods is an indication that pollinators were absent, probably gone locally extinct. Orchid species that have a sexual association with thynniid wasp pollinators are localised and usually have geographically variable flowers. The situation is different with Cryptostylis spp. And their pollinating male wasp Lissopimpla excelsa, as females are a strong flyers. The flowers of Cryptostylis are geographically uniform in each species and the wasp is widespread. Both sexes are very distinctive in colour that show no variation. They are active over Spring and Summer and are great travellers. Of the five entries this month, three were spider orchids and the winner was from this group. 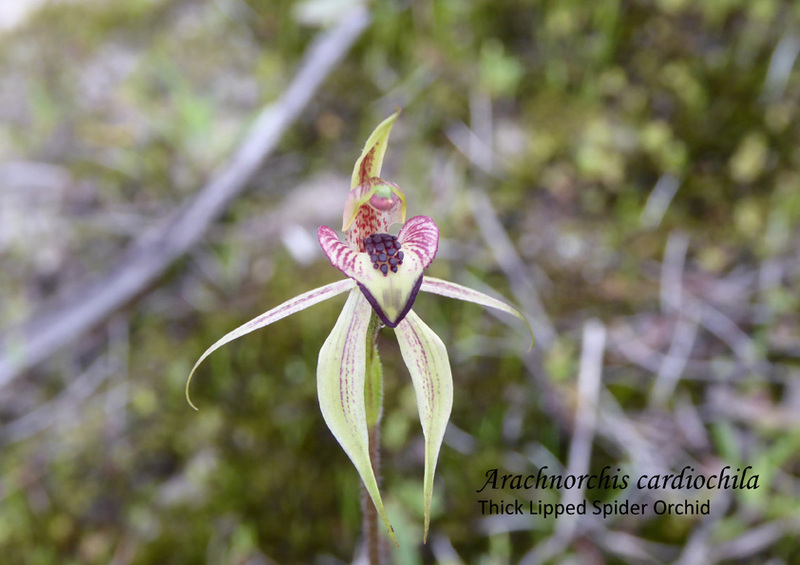 It was Rob Pauley’s Arachnorchis cardiochila (syn Caladenia cardiochila), Heart Lip Spider Orchid which can be found across South Australia and into western Victoria. At one time a specimen was found on Flinders Island, Tasmania but as it was collected in 1947 it is considered extinct in that region. This lovely flower is quite variable in colour and form. The heart shape labellum is a distinctive feature of this spider orchid, so it is not surprising that this is reflected in the name. Cardio means heart and chila lip. What probably is surprising is that the traditional heart shape symbol has come full circle. It had a botanical origin. According to cardiologist Professor Armin Dietz the symbol was originally a stylized vine/ivy leaf as evidenced from paintings on goblets from the 3rd millennium. In the Middle Ages, doctors and anatomists used the shape to represent the heart. As at that time Latin and Greek were both the international languages of scholars, including doctors, the word associated with the symbol was the Greek word kardia (ie cardio) meaning heart. Consequently, by the time Ralph Tate names this species in 1887, the shape has become intrinsically linked with the heart and so it must have appeared to him as an obvious descriptive name. 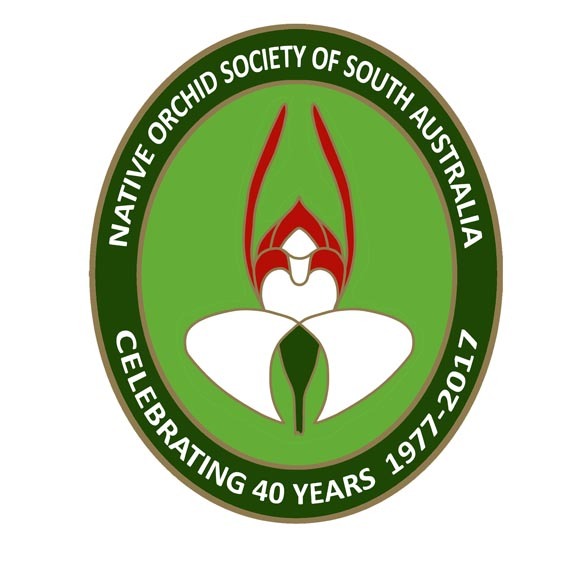 There are several field guides which give a detailed description of the species including South Australia’s Native Orchids DVD-ROM which is available for sale from NOSSA. With a theme of Orchids and Insects for the November meeting it was hoped that there would be some entries with pollinators and therefore there would be two categories Insect Visitors and Pollinators. This month’s article will feature the Pollinator section and Insect Visitors in the next month. In all there were four potential pollinator photographs. The insects were either scrounging around at the base of the column or else they had the pollinia attached to them. Unfortunately only one was a true pollinator so the category became Insects with Pollinia. The winning photograph of Arachnorchis brumalis with an unidentified hoverfly was taken by Chris Davey. Interestingly the other two pictures also featured Arachnorchis species with the hover fly Simosyrphus grandicornis. Resembling a wasp but minus the sting, this species is one of the common hover flies native to Australia. Called Hover Flies owing to their ability to hover motionless in one spot, they are also known as Flower Flies because they are often found hovering around as well as pollinating flowers. It is not surprising, therefore, to find them around orchids. Yet instead of being called pollinators they are non-pollinators (Bates & Weber 1990). They visit the orchids, forage inside the flower and may even manage to collect some pollinia₁ but that is all. They may not necessarily visit another flower of the same species but if they do, they will fail to deliver the pollinia to the stigma2. Rudie Kuiter agrees with Bates that hover flies are not orchid pollinators but just when we think we have worked it out he adds “but we have at least one orchid in Victoria that is pollinated by hoverflies and witnessed now several times and this is Caladenia catenata” (synonym Petalochilus catenatus). Notwithstanding the case for this species, it would appear that in most cases hoverflies remove pollinia so that it is not available to a more specific pollinator. Why then are the hover flies attracted to the orchids? Is it for food? An internet image search revealed that hover flies visit the flowers of many different genera including Thelymitra and Diuris. This is interesting because flowers are the food source for hover flies but though many orchids promise food, many species do not produce the nectar and pollen (as a food source) that they desire. Diuris and Thelymitra belong to this group of non-nectar producing flower. Other orchids that don’t produce nectar include Gastrodia, Dipodium and the Duck orchids. 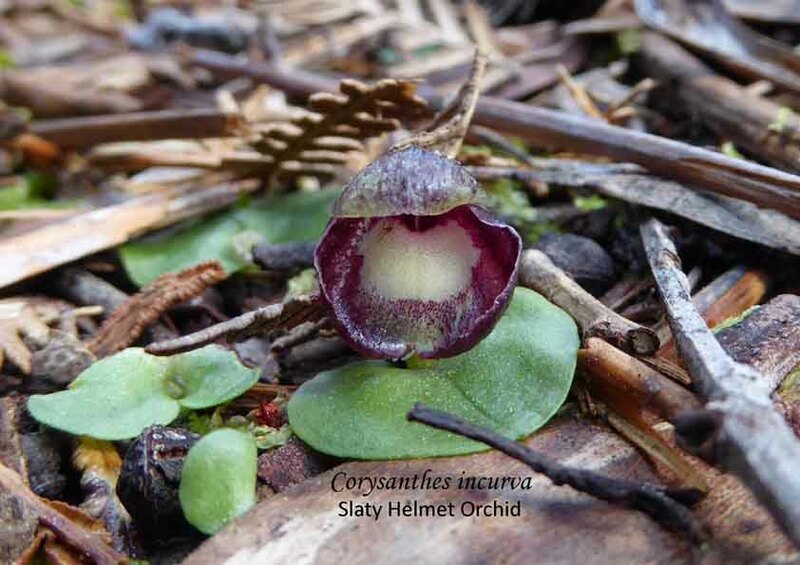 Again, there are orchids such as Crytostylis which produce minimal nectar and with Prasophyllum the nectar is hidden in cells that require puncturing – not a good food source! Having discussed hover flies as non-pollinators, in this month’s competition, which photograph had a pollinator? – It came last and was Robert Lawrence’s photograph of a native bee on a Dipodium pardalinum, another non-nectar producing orchid. The story of this photograph was featured in Photographing Orchid Pollinators, April 2014 Journal as well as in a previous blog on Photographing Pollinators. 2The stigma is a sticky depression (or swelling) at the front of the column, the receiving surface for the pollinia that is necessary for germination.